The Centauromachy began, according to most accounts, with the wedding of Hippodamia to Pirithous. 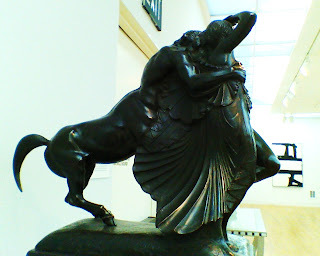 Because Hippodamia was kin to the Centaurs, they were invited to the wedding feast -- but apparently Pirithous was a little bit too generous with his wine, and the centaurs, unused to such strong drink, got drunk. And not giggles and daring fun, either. Angry and Lusty drunk. Wild and Violent drunk. So wild and so angry, in fact, that they thought it would be a good idea to make off with the bride herself, along with a fair number of other women, for the purposes of, well, violence and lust. 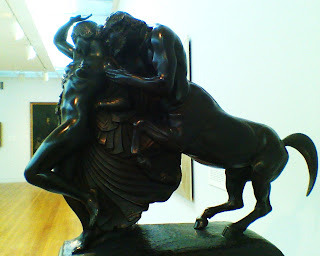 As you can imagine, Pirithous did not sit still for this, and with Theseus at his side, and the help of a number of other guests as well, they attacked and defeated the centaurs, rescuing the women, and driving the remaining horse-men from the city, and perhaps even the lands of the Lapiths entirely. Hippodamia escaped mostly unscathed, though I can't imagine she looked back on her wedding day fondly after that. There's a reason that mythology has been a subject of creative endeavors for so long. There's so much room in it for dynamic emotion and beauty. There are so many conflicts waiting to be brought to life and characters to explore. For instance -- how is Hippodamia, a woman, related to the centaurs (bred from mares) at all? Half the fun, for me, is figuring out the story which leads to an answer. Images in this post © me. Citrus had not yet made its way to Greece during the Greek Bronze Age. No lemons and limes for cooking, no oranges, no grapefruits on the table, much to my dismay. Sweet Oranges took their (sweet) time making an appearance in general, really, and in northern Europe they suffered from a lack of availability and cultivation as late as the 15th century AD. But though these fruits weren't yet being cultivated in the west during the bronze age, they were absolutely being cultivated elsewhere. In the Far East of Asia, there are mentions of citrus fruits as far back as 2400 BC in China (and this website by Mark Rieger originally put together for his horticulture class at UGA has everything you'd ever want to know about citrus today, if it's a bit sparse on the days of yore). And if there's one thing we know about the Greek Bronze Age, it's that they weren't shy about trade, nor were heroes like Theseus and Pirithous likely to be afraid of exploring new oceans, seas, or rivers. "And I noted the tunic about his body, all shining as is the sheen upon the skin of a dried onion, so soft it was; and it glistened like the sun" (19.233). This attestation to another commodity of the Far East which had not spread widely allows the savvy writer a little bit of leeway when it comes to bringing Homeric myths into the historical world. While it's clear these kinds of luxuries were absolutely not available to even the common king or queen, it isn't outside of the realm of possibility for a hero to have collected such spoils, or even to have gone out of his way to present them as incredibly valuable gifts for a special occasion. And if there's one thing we know about the Heroes of Greek Myth, Homeric and otherwise, it's how much they loved raiding, rustling, and sacking everyone from their neighbors, to the richest cities and kings they could find. Of course, we already knew that Bronze Age kings likely also fulfilled roles as priests, or religious leaders -- but we shouldn't forget that kings like Pirithous or Theseus? They were most definitely Pirates, too. As a writer, you hope that you'll never have to do anything with all those math classes you took, outside of the incidental bill-paying and household annoyances. But really? The math, it never goes away. Whether you're trying to calculate the number of fleas in a 15th century, plague-ridden village or the number of copies you need to sell to make back your advance, math is still part of the writer-life. Sometimes, though, playing with the numbers can be a lot of fun, all the same. 62 queries for this particular manuscript, sent out over the course of 2 years. 1 Amazing Agent, found by some coincidence of cosmic good fortune! The very best kind of Math, my friends. Greek and Roman Mythology from the University of Pennsylvania! I have a couple of the suggested texts already on my shelf, and the rest I have been reading and referring to online, but now I kind of want to buy them and take this course as something of a review class. My Classical Studies program was focused a lot more on the history than the mythology (my disappointment knows no bounds), so it would be nice to supplement things a little bit, and I am a TOTAL sucker for learning -- it's totally possible that this professor will talk about things in a way that I haven't considered and I want in. No start date yet though. The Ancient Greeks from Wesleyan University! My Ancient History professor in college was amazing, and really asked a lot of us in regard to primary source reading and critical thinking, interpretation and communication of those ideas. I'm not too proud to admit I did not always deliver to his expectations. I wanted to, though! I swear! Anyway, this class would be fun as a review, too, and the text is entirely online if you prefer not to buy it, with handy links in the syllabus. It begins March 18th and let me refer you to my note above about being a sucker for learning because that is how this is going down. Plus the course load is only 2-4 hours per week -- totally manageable! In fact, I am already signed up, and you should too! A third option in the "Free online class" category is not a formal class, but definitely a great survey of history available for the taking. A while back, my ancient history professor, Bill Caraher put the first half of a Western Civ I course of podcasts up for free. You won't get a certificate of Accomplishment -- but you WILL learn a lot. *With thanks to Galleycat for directing my attention to the first two!